Hey, Reactorites! 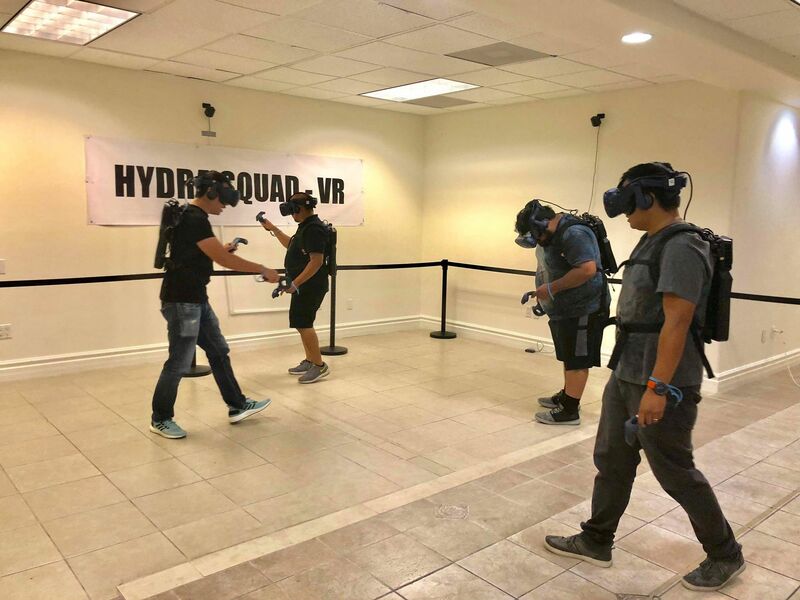 We’re back with another escape room review, and this time we went back to LA Dragon Studios in Van Nuys, CA, to try out their new Hydra Squad VR experience. We have been to this location before and enjoyed the Knights of the Round Table escape room, so we were excited to see what they had in store for us, especially since this was our very first VR Escape Room experience. During our visit, we were able to try one of the two VR escape room games, Depths of the Osiris, as well as one of their haunted VR experience, Hospital of Horror. 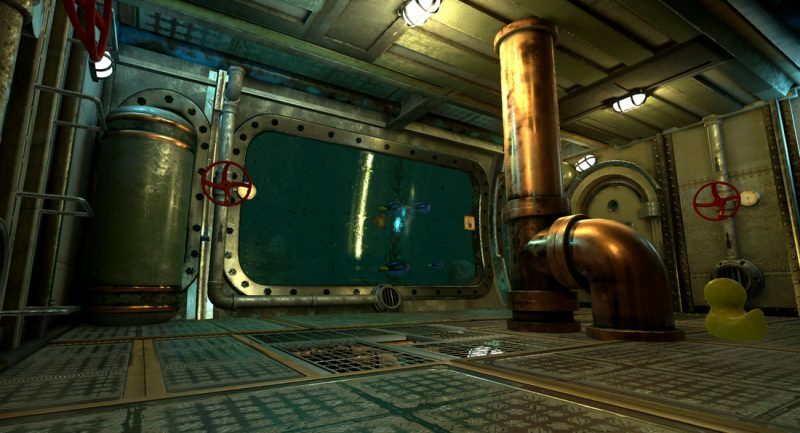 Depths of Osiris is an underwater escape room adventure where you and three teammates solve puzzles to uncover a hidden treasure. Using the Vive Pro, each person wears a portable laptop backpack, so we don’t get caught up in all the wires that are normally synonymous with VR headsets. If you’re like me and you wear glasses, fear not. The googles easily fit over your glasses, and you can adjust the headband so it’s not too tight. Once the game started, it was a little disorienting at first. One of the first things I noticed was that one of our teammates was actually much shorter in the game than in real life. (It all depends on the placement of the VR and the sensors.) You are given a good amount of space to move around, but it can feel like you and your teammates are bunched up together. I remember after the experience being surprised at just how much room we actually had. There were a few times we bumped into each other because you can’t really gauge how close someone is to you. One moment would have one bending down to grab something, and because someone was in the way of the sensor, the hand would disappear or grabbing an item would be tough. We were told the Vive Pro system is still new and doesn’t have four tracking sensors like the previous version does, so hopefully, there will be an update soon. There was one moment where a teammate couldn’t even pick up items and the Vive Pro had to be completely rebooted. Luckily, it fixed the problem, and he was able to just jump right back into it. Aside from a few technical errors, I thought the experience was awesome. A section in the game had me slowly walking around, as you would if you were actually wearing a deep sea diver suit. The puzzles were very unique and since it’s virtual reality, it allowed for completely different elements that we’ve never seen before. Of course, teamwork is still a big part of the experience. There was actually a really cool moment where I threw a spear at a teammate, and he was able to catch it. As far as difficulty, the room was very challenging. On the graphics side, the presentation is amazing. There was one point where a window panel cracked, and the whole time I kept staring at because I thought it would eventually break, flooding our room. There were a few moments that made us jump in Depths of the Osiris, but not nearly as much as the next free-roaming VR experience we did. Hospital of Horror is called it a “Haunt,” so it’s actually not an escape room. When we were loaded into the game, we were all wearing yellow hazmat suits holding flashlights. We could walk around and interact with things, but for the most part, the experience was on autopilot, like a first-person narrative game. The idea seems very generic at first. I mean how many times have you played through a scary hospital in a video game before? But to actually be there, walking around with your friends, is an entirely different experience. There were a few really good scares that scared us the hell out. At one point we had to walk on a floor that was completely broken, and it felt like I was losing my balance. Now imagine if this was made it into a full escape room experience. Overall, we really enjoyed LA Dragon Studios’ Hydra Squad VR. It easy to see how there are certain things that you can pull off in VR that you just can’t replicate in the real world due to production cost. Don’t get me wrong, I still love traditional escape rooms, and I’ll always be fascinated by the engineering and craftsmanship that goes into making them seem real, but VR looks to be a new frontier with a lot of options. And I look forward to seeing what else is cooked up in the near future. If you are in the Van Nuys or Los Angeles area, please do yourself a favor and check out LA Dragon Studios. Not only do they have two VR escape rooms, they also have a real escape room. They are also one of the very few escape rooms that are kid and family friendly, so go check them out. The post LA Dragon Studios’ Hydra Squad is LA’s first free-roaming VR escape room appeared first on Nerd Reactor.